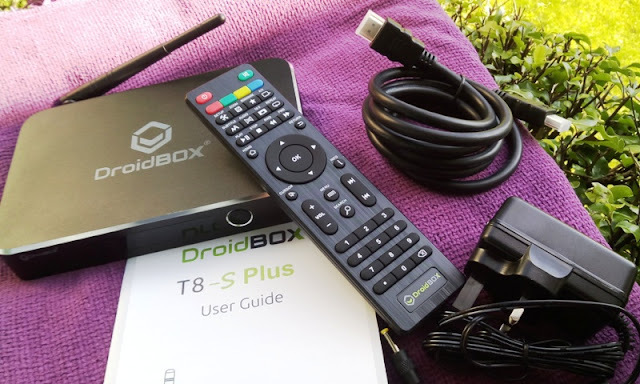 If you are looking for an Android box for watching quality films, play games, listen to music and stream YouTube videos, check out the following review of the DroidBOX T8-S Plus Android TV box home system with six channel sound output (5.1 surround sound). 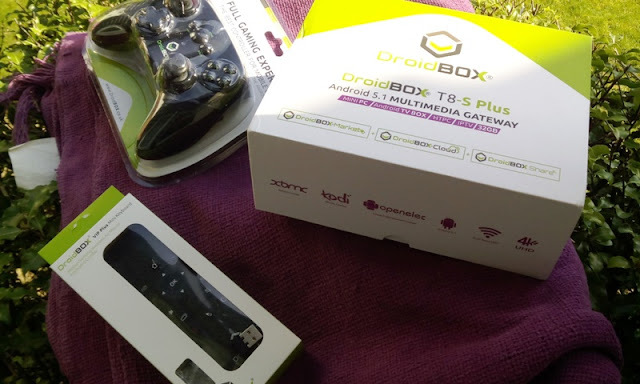 The DroidBOX T8-S Plus is the latest box from DroidBOX, running the Android 5.1.1 Lollipop operating system. 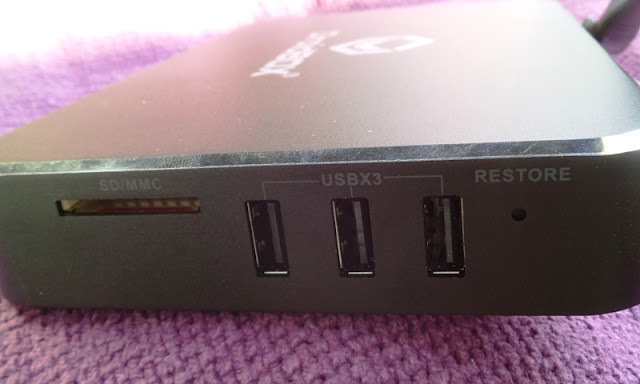 The back of the DroidBOX T8-S Plus features a DC 5 volt power port, 1000 Ethernet port, HDMI port, RCA connection and optical audio out. The side of box features three USB ports, restore button and SD slot to use with a maximum 128GB SD card. The SD card slot is also compatible with the MultiMediaCard (MMC) flash memory card. The front of the box has a LCD display, IR receiver and power button with LED indicator that shows blue (when the unit is on) and red when the unit is off. The accessories that come along the include HMDI Cable, Power Adapter, Remote Control, Manual. 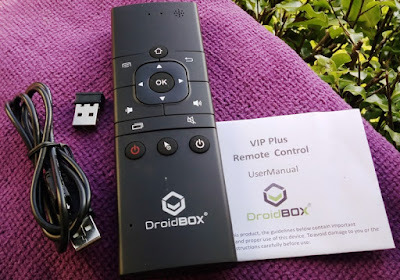 Right out of the box, I already love the DroidBOX T8-S Plus as it comes pre-loaded with the XBMC/Kodi 15.2 Media Center, 4K video playback, Dual Band Wi-Fi 2.4/5GHz, bundled with DroidBOX gamer's edition which includes VIP Plus mini keyboard and DroidBOX Play Gamepad (above). The built-in processor in this fanless miniPC is a 2.0 GHz Quad Core Cortex A9 Neon Amlogic S812; while the GPU is Mali-450 Octa Core. There is a total 2GB DDR3 of RAM with 32GB internal memory, though the 2.5 inches HDD bay allows you to expand the memory up to 2TB (terabyte), which is great. 2) If you are not connecting wirelessly, you can connect via a network cable; in which case, select the Ethernet option. 4) From the home screen, select the settings tab (two gears symbol). From this tab you can gain access to the Device settings such as Network, Display, Sounds, Apps, Storage & Reset, as well as Preferences (date/time, language and more settings), Remote & accessories (add Bluetooth accessory) and Personal (for setting security and restrictions and add account). 5) Select the Display tab so you can adjust the screen resolution (from 1080p-60Hz to 480i-60Hz), screen position (zoom in/ zoom out screen) and screen rotation. 6) Select the Apps tab, which gives you access to your downloaded apps, System app and Running apps. From System App, you can select Browser settings to clear the cache, data, Force stop and turn Notifications off/on. 7) To access more settings, select Preferences and scroll all to the way to the right and select More Settings. You will also need to set up the OpenELEC operating system in order to download backdrops and thumbnails for your movies and TV shows, as well as stream online content from sites like YouTube. Setting Up the new OpenELEC installation is easy by launching the Switch 2 OpenELEC application, following the wizard and navigating to OpenELEC settings (System >OpenELEC). To access OpenELEC's configuration and developer update, navigate to Programs and select Add-ons. To Switch to Android and/or Reboot, click the blue power button on the left bottom corner (the box will turn off and reboot itself to Android). 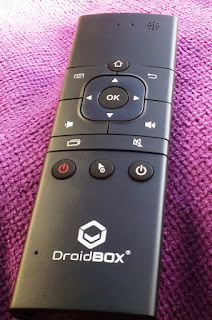 The DroidBOX T8-S plus operating system runs on the Lollipop Android version so if you do not see the navigation bar, you will need to download a navigation bar app from Google Play Store. There are many navigation apps to choose from but not all of them work. In fact, the only app that has worked for me to get the navigation bar is the one by Kimcy929. Once installed, go into the app settings and turn on "Show virtual navigation bar" and "start on boot". DroidBOX T8-S plus also comes with many pre-installed applications such as ACE player, RebootManager, DroidBOX Share, Chrome and AirPlay. The AirPlay application allows you to use your iPhone, iPad or iPod touch to wiressly stream music and data straight to the DroidBox. The RebootManager allows you to reboot, hot reboot, reboot recovery (if you want to flash it), reboot bootloader and power off. 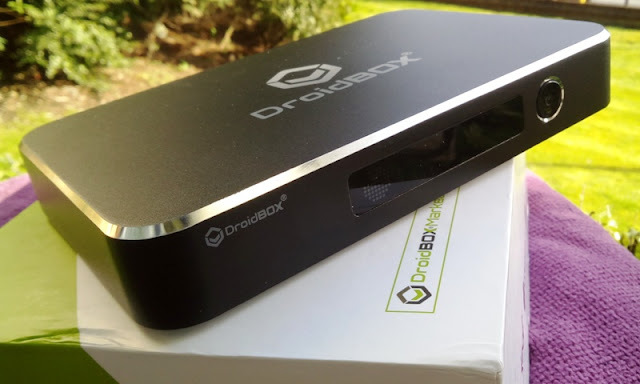 DroidBOX Share allows you to stream media content to and remote control T8-S Plus from IPad, IPhone or any Android device. It's really cool the DroidBOX T8-S Plus is rooted as it allows you to do so many things (SuperSU is also pre-installed). 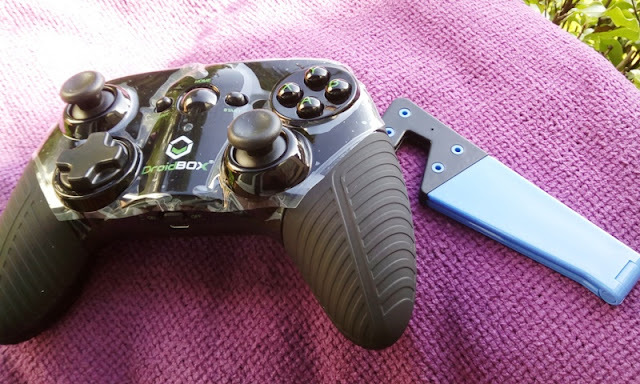 Having both the KODI and OpenELEC operating systems is also a plus for the DroidBOX T8-S plus as you get better performance with OpenELEC since you can run OpenELEC with basic Linux without Android in the background. RAM consumption of OpenELEC is only 8% versus 60% RAM consumption when running KODI in Android. The CPU usage is also much lower when running OpenELEC so free memory in OpenELEC is around 1.4GB (while free memory in Android is only around 500MB). The media performance in OpenELEC and KODI when playing H264 (MPEG-4 AVC) videos in YouTube and NETFLIX is very smooth in 4K and Full HD resolution without any audio distortions, skipping frames or frame drops. As far as watching H265/HEVC videos in 4K and Full HD, OpenELEC is able to handle these formats a little better than KODI can though video playback is still laggy. As far as gaming performance, you can play all games in 720p and Full HD without any lags, low FPS or any significant FPS drops (PlayStation 4 controller and Xbox controller are both supported). 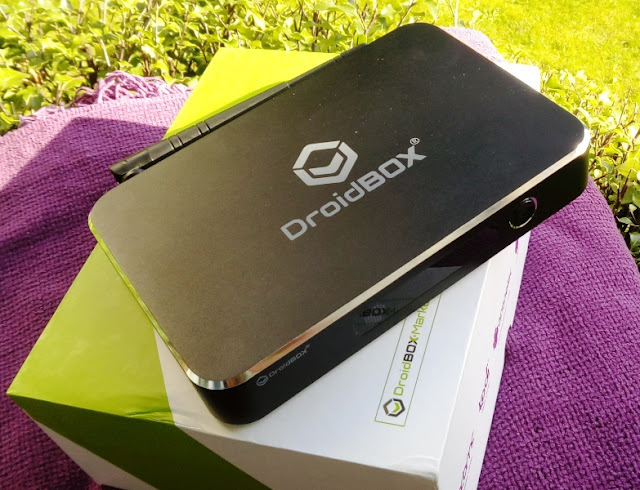 DroidBOX T8-S Plus offers a great user experience thanks to quality hardware, regular software updates and 32GB internal partition. 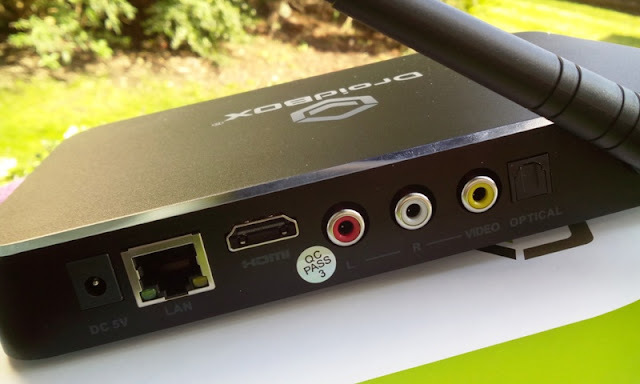 DroidBOX T8-S Plus runs OpenELEC embedded operating system built around KODI so it's easy to use as it comes pre-configured. Browsing is smooth and features an OTA updater. The integrated hard drive allows you to record your online streaming and favorite TV shows, as well as other data. The power consumption is below 10 watts, making it super energy efficient. 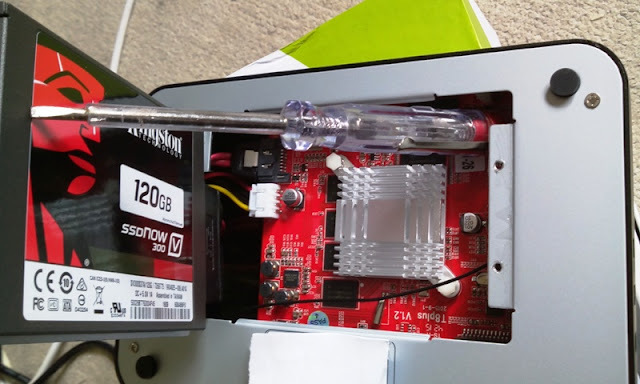 The standard Kingston 120GB hard drive can be replaced with a 1TB 2.5 inch SATA HDD (max height 9.5mm ). The HDD is used for internal storage and all 120GB is available to install apps and download files. The multi-tasking widget from the home screen allows you to kill all running apps in the background quickly and easily. Have you tried to output 6 channel surround sound. I've used a Ouija with Kodi to try to make a media machine. This was a couple of years ago, but it failed at actually performing 6 channel audio. What is the price range also.